STRONGSVILLE, Oh. 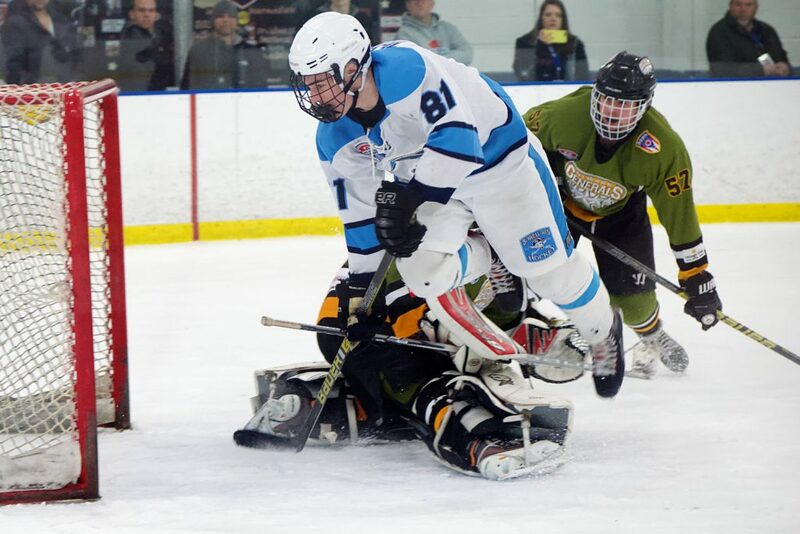 — The Burrell Bucs defeated the Newark Generals 8-4 at OBM Arena on Sunday and are now headed to the 2019 USAHockey High School Division-II National Championship game. Senior forward Dylan Zelonka was front and center, firing home a natural hat-trick in the second period, as well as adding two more late in the stanza. The goals weren’t of the cheap variety, as the playmaker made several acrobatic moves with his second being the most impressive- A forehand, backhand deke around the defenseman that he finished on the backhand- in mid-air. The Bucs also received two goals from Stewart, whose third period backhand through traffic led many people to wonder how he pulled off the feat. Nathan Smith added a goal late on a four-on-four to seal the victory. Newark received goals from Austin Branham, Reese Towbridge, Cody Hammack and Jack Bortle. Drew Burkett started for the Bucs and gave up the first two goals, but was replaced late by Austin Schueler as the game started to get out of hand. Ryley Passwaters started for Newark and stopped 21-of-29 in the loss. After the loss to Ringgold in the Division-2 Championship last week, the Bucs regrouped and simplified their game. Coach Max Rickard focused on a key point- special teams. The high-scoring affair saw twelve goals scored in the entirety of the game- something you wouldn’t have believed after a scoreless first frame that saw the two teams combine for thirteen shots – a number that both teams would match or surpass in the second individually. Rickard saw a weakness in the Generals system and pounced on it. Dylan Zelonka finished the regular season with 60 points, and had eleven over the three games he competed in during the Division-2 postseason. His six assists in the first four games of the tournament were ample support for his teammates, however it was Zelonka who felt that he needed to step up. The Bucs will face Boulder/Monarch for the National Championship on Monday at 10:30 a.m. at OBM Arena in Strongsville.